Energy Transfer Partners, DAPL’s owners, is pursuing the latest court challenge, trying to force the federal government to give it the needed permit to bore under the Missouri River and finish the project in North Dakota. The court challenge comes in response to the U.S. Army Corps of Engineers decision to take time for more study on the project and input from the local Native community. MPR reports that the court decision might not come until early January. Tension flared anew on the Dakota Access pipeline as protesters tried to push past a long-blocked bridge on a state highway, only to be turned back by a line of law enforcement using water cannon and what appeared to be tear gas. The United Nations Office of the High Commissioner for Human Right issues a statement Nov. 15 critical of how North Dakota law enforcement as treated the Water Protectors. Kiai called on Energy Transfer Partners to stop all construction within 20 miles of where it plans to bore under the Missouri River. His call was endorsed by several other U.N. Special Rapporteurs. Here is Indian County Today’s story on the statement. The largest bank in Norway, DNB, has announced that it has sold its assets in the Dakota Access pipeline. The news follows the delivery of 120,000 signatures gathered by SumOfUs.org to DNB by Greenpeace Norway and others urging the bank and other financial institutions to pull finances for the project. DNB recently indicated that it is reconsidering the loan it provided, which amounts to 10 percent of the total funding. Chairman Richard McCloud of the Turtle Mountain Band of Chippewa called it a “dishonor” when he heard legislators canceled the address, a tradition that leaders of North Dakota’s five tribal nations have rotated in each of the past 16 legislative sessions. The state’s heavily militarized response to DAPL, and its decision to cancel the speech, is hurting the state’s relationships with other tribes, the article said. Spirit Lake Nation Chairwoman Myra Pearson went to the Capitol in September for a meeting. A protest was going on, and she and her grandson were met by a line of law enforcement officers. She was removed and hasn’t been back. Pearson was in line to give the next State of the Tribes address. She wanted to talk about the drug epidemic on the reservation. “We don’t have any relationship any longer with that state Capitol building,” she said. Last week, we wrote a blog about a protest at the St. Paul headquarters of the U.S. Army Corps of Engineers, part of National Day of Action to pressure the Corps to deny Energy Transfer Partners the go-ahead on pipeline boring under the Missouri River. In Los Angeles, an estimated 1,500 protesters gathered peacefully in the financial district, while hundreds participated in a march at Daley plaza in Chicago. Sen. Bernie Sanders joined a crowd in front of the White House, and police in riot gear met protesters marching in Denver…. 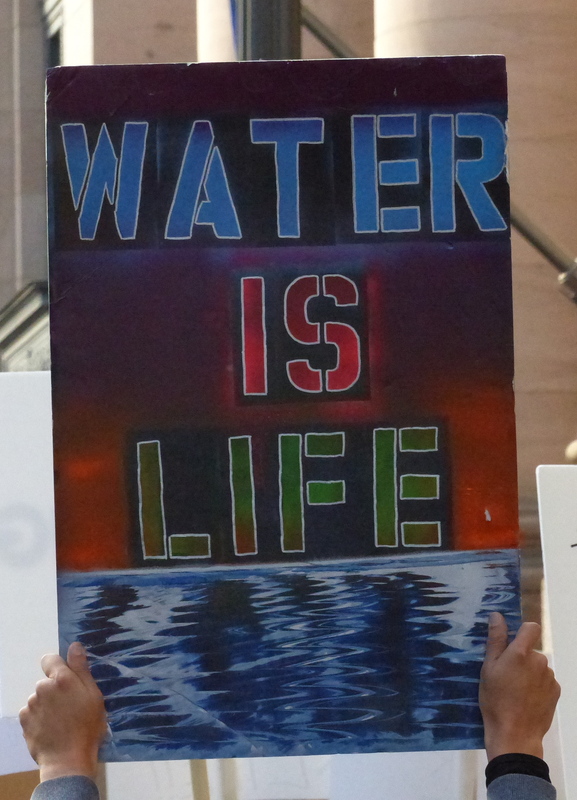 Over 1,500 anti-Dakota Access Pipeline protesters marched in Lower Manhattan, many holding signs and placards decrying the pipeline, and others warning of a bleak future for their cause under a Trump administration. After the rally, approximately 39 people staged a sit-in just opposite the U.S. Army Corps of Engineers’ office. The group repeatedly chanted “protect our water” as dozens of police officers surrounded them threatening arrest for disorderly conduct. All were arrested, according to police. Not really sure what to make of that comment, Mr. Warren. It is not reassuring. Planes crash and pipelines leak. Both can be devastating. Scientists say five years of drought are to blame for much of the destruction. The lack of rain has put California’s trees under considerable stress, making them more susceptible to the organisms, such as beetles, that can kill them. Unusually high temperatures have added to the trees’ demand for water, exacerbating an already grim situation. Thanks for these timely updates!